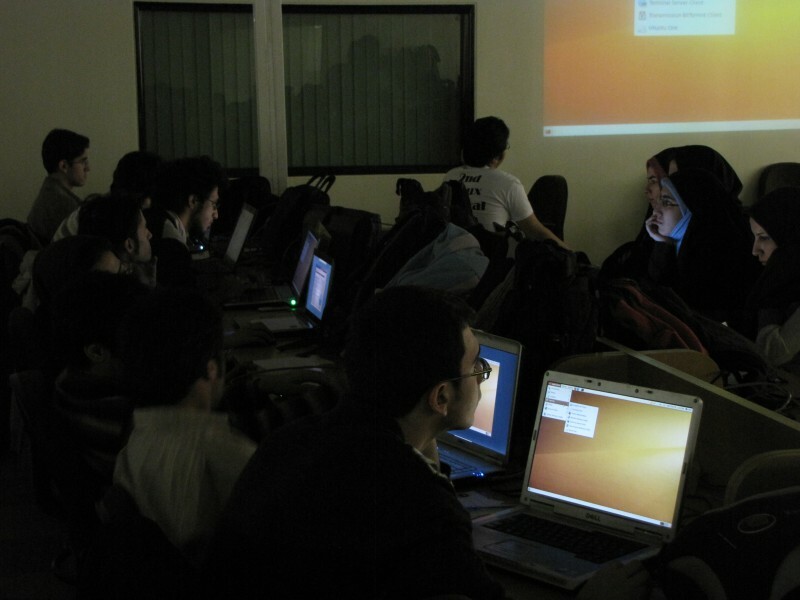 Second Linux Festival has been successfully held at Amirkabir University of Technology (AKA Polytechnic). It has been divided into three main levels of Beginner, Intermediate and Advanced. The topics has been presented inside Computer Site of CEIT department under a much better quality comparing to the last year’s festival. People installed, tasted and utilized a new operating system in a well mannered approach. During the installation process and most of other presentations, our local server and mirror of software packages (aka SSCLinuxBox) helped a lot and became the standard way of sharing files / installing software during the festival. The complete program and schedule can be found here. Although it was the second experience on Linux Festival in our university and we fixed almost all of problems which could be seen in the last one, there are always problems and we can learn from them. One of the main points I got in the first few presentations, was the importance of coordination between presenters around the topics and details which is going to be presented. Lack of such synchronization and coordination before the festival, resulted into problems in presentation topics and contents since some of presenters did have a different idea about listener’s levels and prepared some extra stuff for those who where beginner. In addition none of us knew about the dependencies of subject that was going to be presented, whether they have been discussed up to now or not. Yet another point on the art of presentation and teaching. In situations like this, where every presenter is a professional in a field and likes the topic and have chosen to teach it, hiding the unnecessary details is a very very hard task. A teacher should have the ability to place and simulate the thinking process of listeners and remove the details that might break this thinking process. On the other hand, he should analyze the required dependencies of current topic and explain them before anything. I got many feedbacks regarding the presentation style and found that the estimation of listener’s level and correct decomposition of subject into the simplest form are keys to a successful presentation. It was a cool and friendly atmosphere. The support team and technical team were both working hard to reach the best quality and it made it a real memory. Its notable that this was the first serious work/project of our new Scientific Committee and the results were incredible. This entry was posted in Believe Me and tagged Linux, RootShell. Bookmark the permalink.